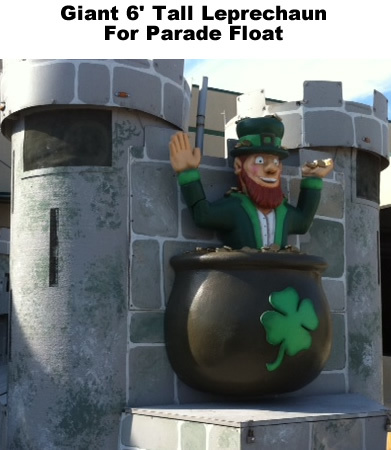 Custom Made Big Giant Foam Props - Sculptures. 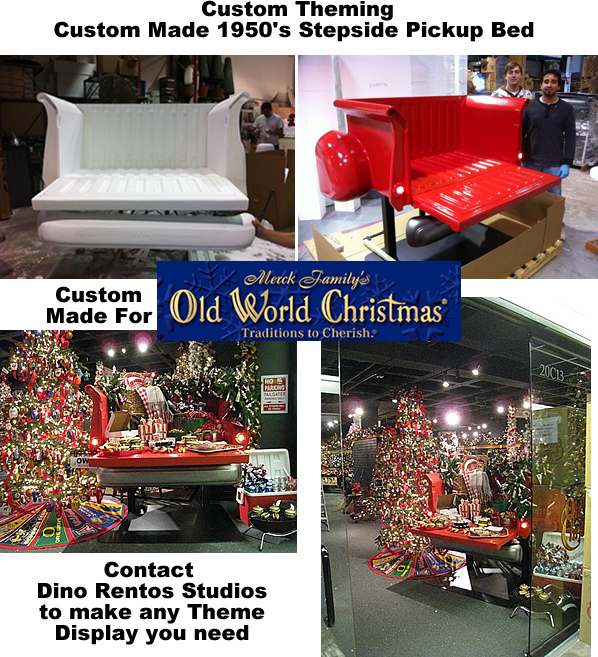 Made to Order Prop Maker display retail trade show film movie theater play decoration - Dino Rentos Studios, INC. 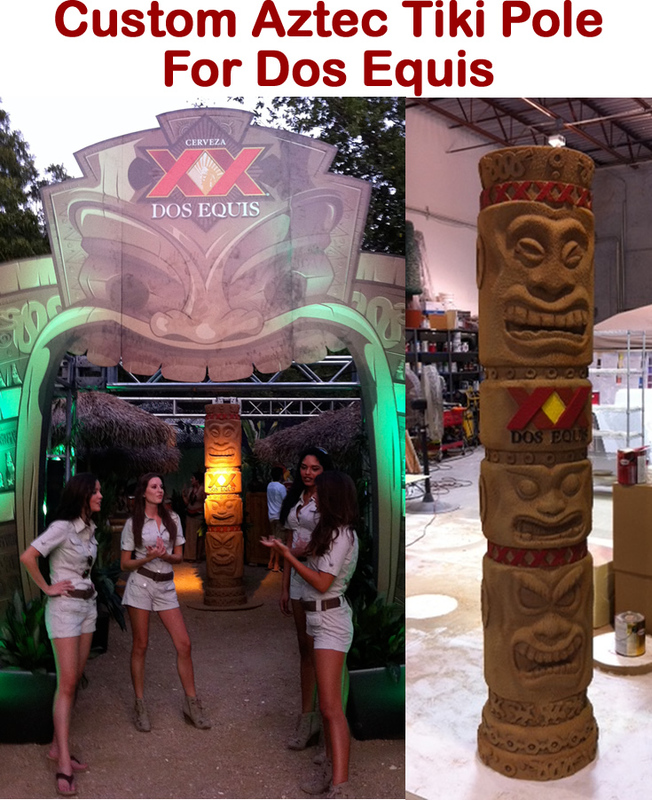 Pro Services for Custom Made Scenic Foam Sculptures & Props ! This Custom Foam 15' Tall Castle Tower and Walls were manufactured for Dead Cells and displayed at the PAX East 2019 Tradeshow in Boston, MA. Large 3D Foam Mushrooms plastic coated and painted used for Film Production. Order our standard red mushrooms or ask for custom colors. This adorable "Charlie" Baby Prop was custom manufactured for Tiny Human Foods. Charlie has graced the stage of Dr. Oz winning over the hearts of many as he is displayed all over the country. This Custom Foam Clam Shell was painted in a beautiful soft blue color giving it the perfect finish! Our team created a 3D digital model from a picture rendering. The unit was carved in EPS Foam, steel embedded for outdoor install, Polyurea coated for durability, and painted by our artist. Custom Print on Foam Medical Hip Spacer Device manufactured for OsteoRemedies® to display at the AAHKS 2018 Exhibit. 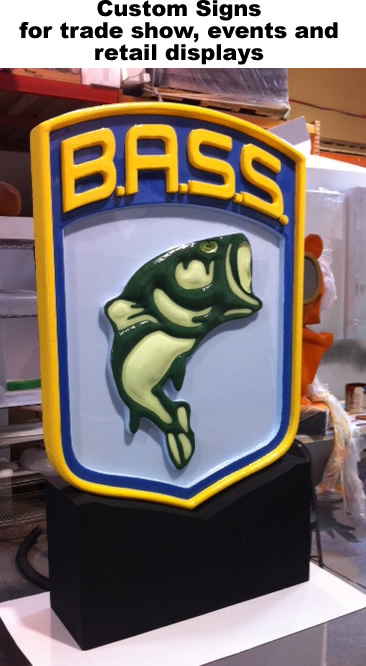 Custom Foam Logo manufactured for Nulite Lighting to display at Tradeshows. These units were CNC cut in EPS Foam and hard coated with Poly Urea Plastic. Custom 10 FT Long Foam Dog Bone manufactured for The Barker Lounge in NJ. The unit was plastic coated and steel reinforced for exterior use. Custom Painted Foam Logo and Hexagons manufactured and displayed on the stage set for Presidio Exchange 2018 in Orlando, FL. This 3.5 FT Tall Custom Foam Charger Head Logo was manufactured for Hillsdale College in Hillsdale, MI. The unit was hardcoated and painted for durability and longevity. 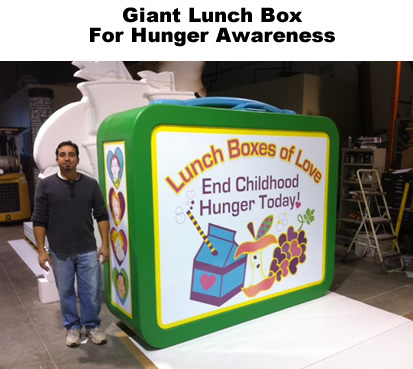 Our 4 FT Tall Foam Apple with custom vinyl graphics. 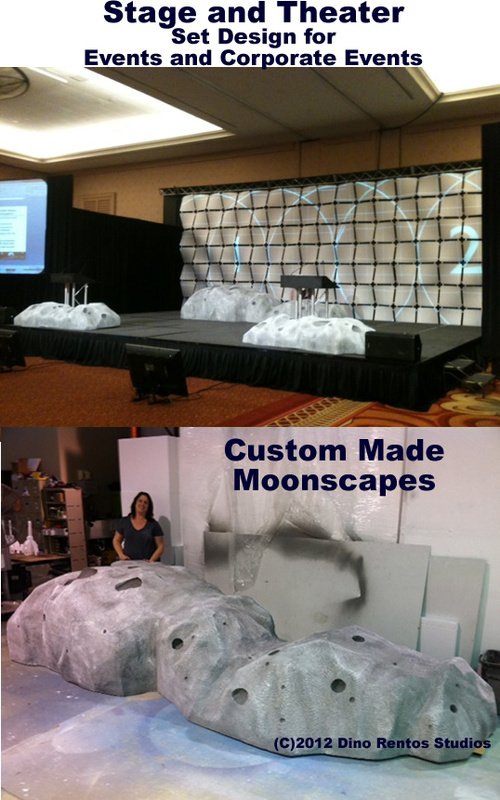 Custom Foam Campfire and Storytelling Rock manufactured for a corporate event. Custom 13 FT Tall Print on Foam Wizard of Oz Entrance manufactured for the Jack & Jill of America Foundation. Dawn celebrated 40 years of helping save wildlife with these Custom Print on Foam Dish Soap Bottle and Duck Props. Custom 6 FT Wide Foam UFO and Rock Display. This unit was carved in EPS Foam. The UFO was coated in Poly Urea Plastic and the rocks concrete coated. The pieces were finished with paint giving the prop this great realistic effect! 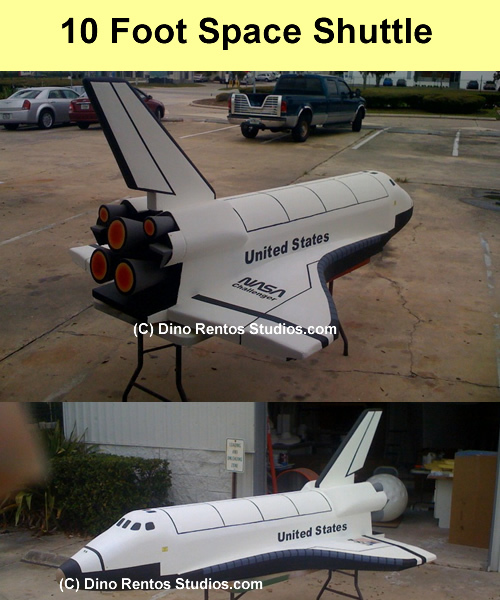 6 Ft Tall Custom Foam Astronaut & 5 FT Tall Moon Facade Prop manufactured for Ripley's. Foam Dumbbell Prop manufactured for the Miami Dolphins. Print on Foam Book Characters we created for the Children's Book, Haibu, written by Blake Freeman. We had a great time in St.Louis at the 2018 Transworld's Halloween & Attraction Show!! Attendees loved our concrete coating and the Big Heads were a huge HIT! 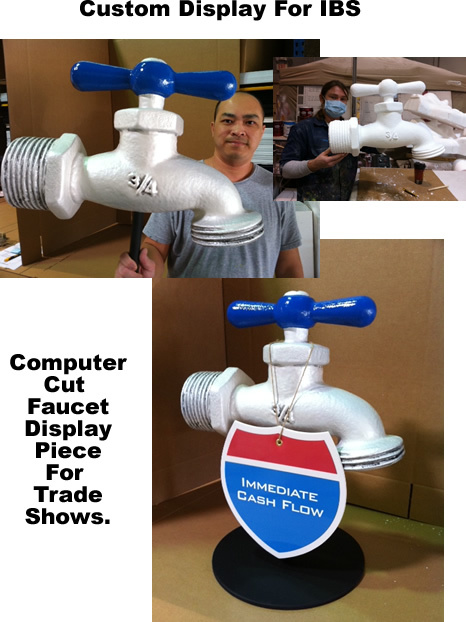 Custom Large Foam Motor Oil and Transmission Fluid Bottle Props manufactured for Idemitsu Lubricants America Corp. 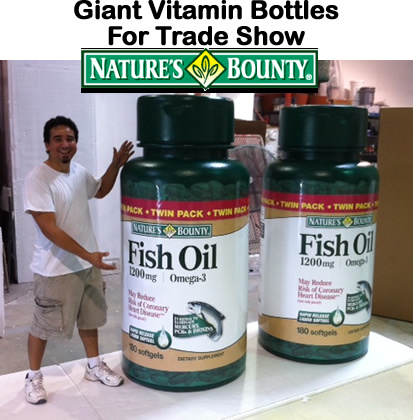 These oversized product repliacas were displayed at the Worldpac Supplier & Training Expo Tradeshow. Custom Large Foam Photo Frames with metal stands. Giant 3D Custom Foam Dog Toy Props. CAD files were provided and each item was CNC Routed and hand finished by our artist. The units were branded with vinyl labels. Custom EPS Foam Carved Heart Logo. Custom EPS Foam carved I-Beams manufactured for a production set display. These units were painted in a faux rust metal finish. The beams were 20 FT long comprised of two 10 FT sections. Giant Custom 3D Foam Human Brain Prop carved in EPS Foam and Painted by our awesome artists. The unit was over 6 FT Tall and 8 FT Wide. This 3' Tall x 8' Wide Custom Logo and 7' Tall Alligator Photo Prop was 3D carved in EPS Foam, Steel Reinforced, Hardcoated in Poly Urea Plastic, and Painted to be displayed outdoors for Wild Willy's Boat Tours. Custom Foam Character Prop manufactured for Islands Pediatric Dentistry in Gilbert, AZ. This Dog with Surfboard Foam Prop is displayed in the lobby of their dentist office. Duckies requested this awesome Custom Foam Duck Prop to be manufactured for their retail store in Seaside, FL. The prop was bolted to a base with lock wheels for easy maneuvering. Our studio mass produced these Custom Foam Boot Retail Displays for Garrison Brothers Distillery. These 7 FT Tall Custom Foam Displays were manufactured for Foxwoods Resort Casino in CT.
7 FT Tall Cheeseburger manufactured for an exterior sign display. The unit was hard coated, painted, glossed, and embedded with an internal steel structure for durability. 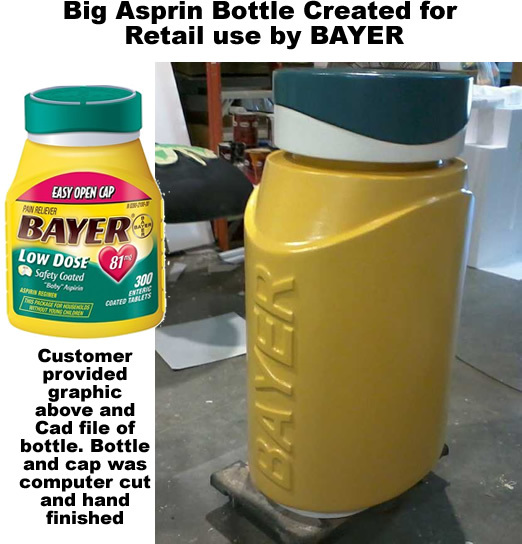 Bee Bald, LLC contacted our studio to manufacture this 8 FT Tall Foam Bald Head Relief Prop and 4 & 5 FT Tall Bottle Props for a tradeshow. 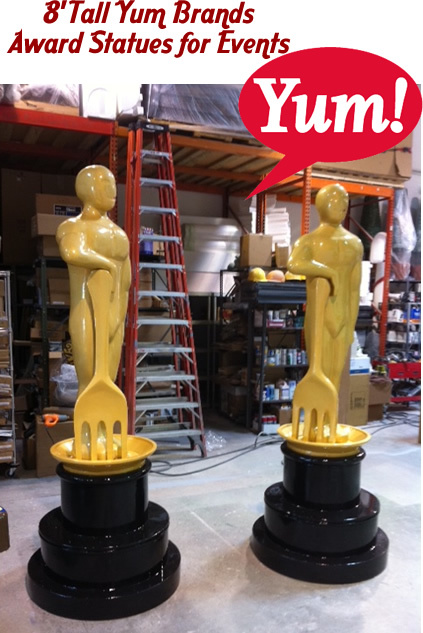 Client contacted DR Prop Studios to manufacture these 5 FT Tall Gold Trophy Replicas. 6 FT Tall Logo manufactured for Ritz Safety in Tampa, Fl. 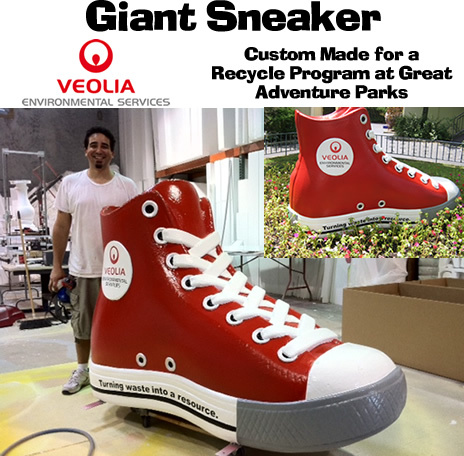 5 FT Wide Foam Sneakers manufactured for Ted's Shoe & Sports in Keene, NH. Custom Foam Signage and Balloons manufactured for The Guadalupe Center Donor Wall in Immokalee, FL. 10 Ft Meat Cleaver manufactured for Prime Serious Steak in Sarasota, Fl. DR Prop Studios manufactured Large Custom Foam Candy Props and Displays for Bourbon Streey Candy Company in Texas. Custom Foam Christmas Window Displays manufactured for Borden Jewelry. 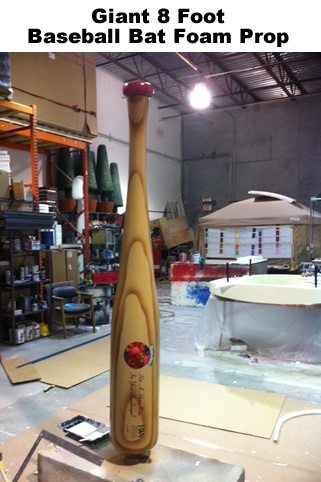 Custom Foam Viking Ship and Oar manufactured for our client to use at their Tradeshow. This worked great as a photo prop for their attendees. Custom Foam 8 FT Tall Grapevine and 3 FT Sun manufactured for NWWF Charity Auction in Naples, FL. 6 FT Tall Lighter manufactured for Arrow Lighter in CA. Custom Tooth Mailbox manfactured for Dental Office to display outdoors. The wire (steel) brace added the perfect touch! Custom Foam Sealife Fish, Plants, and Hermit Crab Character manufactured for Frozen Yogurt Store display. 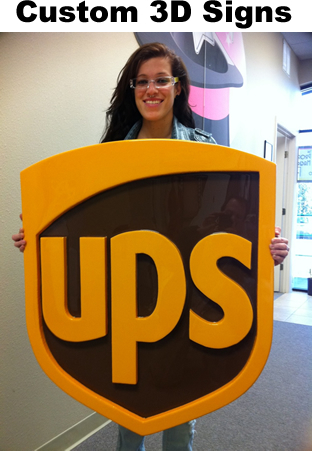 Giant Scenic Foam Letters for Events and Tradeshows. The uplighting was the perfect touch! Giant Scenic Sculpture Prop Bottles. 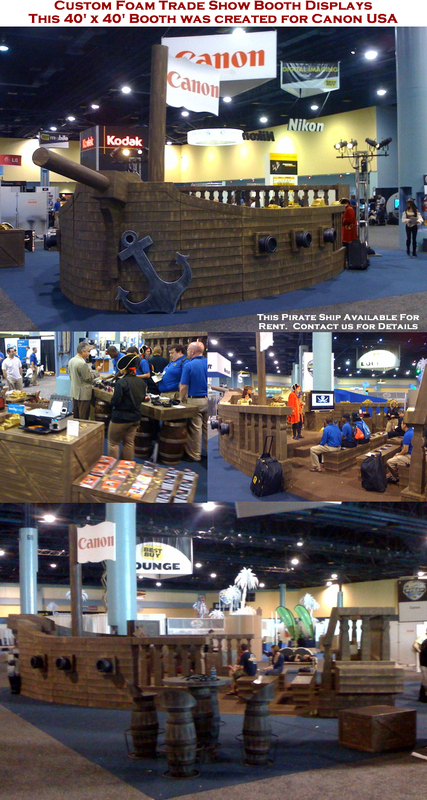 Toy manufacturer had DR Prop Studios enlarge their building block toys for a trade show. 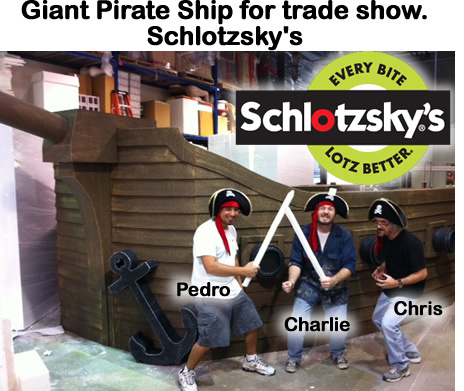 Call us to make giant sculptures of your toys or products for displays and trade shows. 8 FT Wide Foam Oyster Clam Shell manufactured for a ballet performance. The unit was custom carved, coated, and painted. It was also reinforced to handle the weight of two adults. 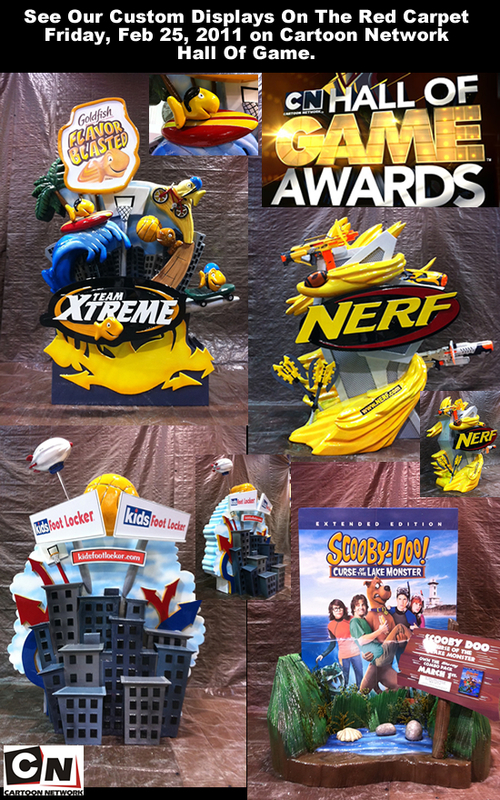 Custom Giant Print on Foam Props manufactured with opening to house jewelry display cases for Parle annual event. 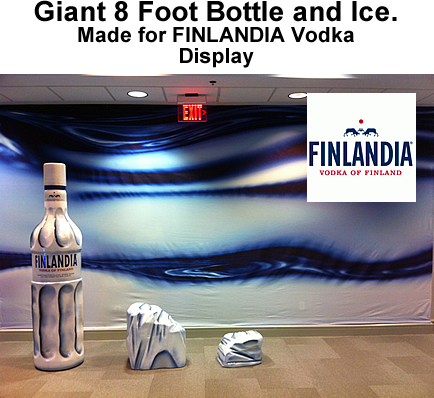 Custom Giant Foam Wine Bottle and Glass manufactured and used two years in a row. Customer requested a repaint for the 2nd year! 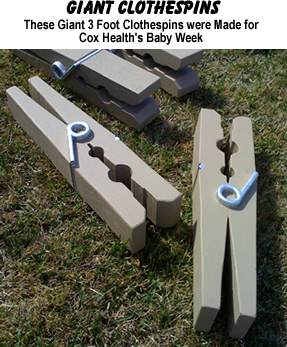 Manufactured in EPS Foam and sprayed in a durable Poly Urea Plastic Coat. Real Life Size Angry Birds Set was Custom Made for KNEX brand Toys and the Philadelphia Eagles. Custom Foam Prop Sculptures were Made for Comic Con 2012. American Dad, Simpson's, Cleveland Show, Family Guy, Bob's Burgers, Sunny in Philadelphia, and Wilfred. The Fox cartoons were placed on the Pedicabs. Custom Foam Sculptures Made for Tribes Ascend Video Game. To Display at Trade Shows. 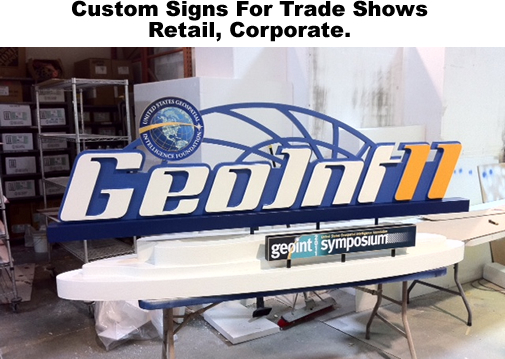 Custom Made Trade Show Booths sculpted to your designs or need. 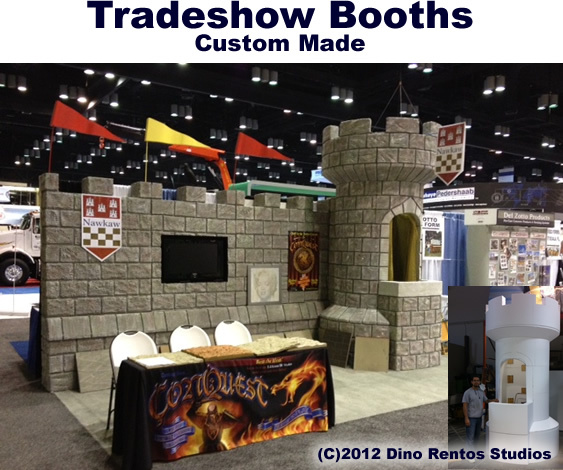 Custom Trade Show Displays, Props or a complete Foam Trade Show Booth. 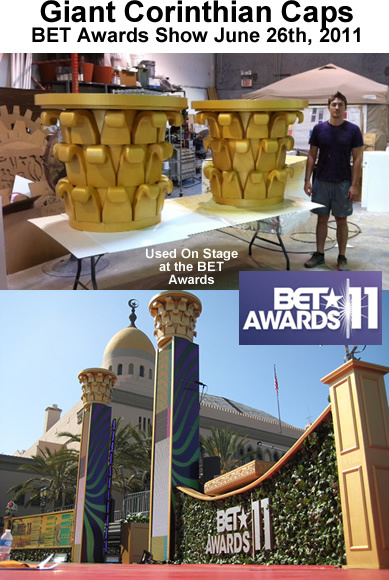 Custom Foam sculpture Props for Stage and Set Design. 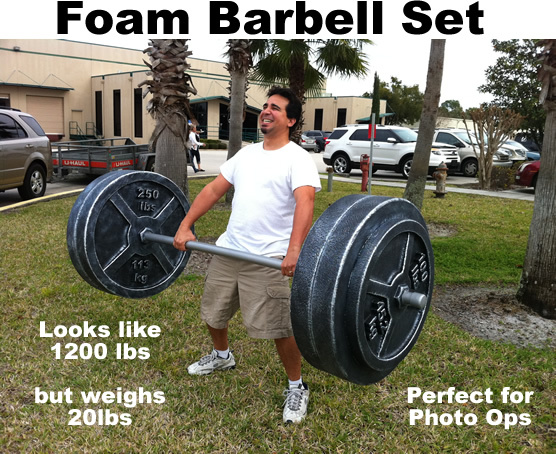 This fake barbell foam sculpture prop looks like 1200 pounds but is only 25 pounds. 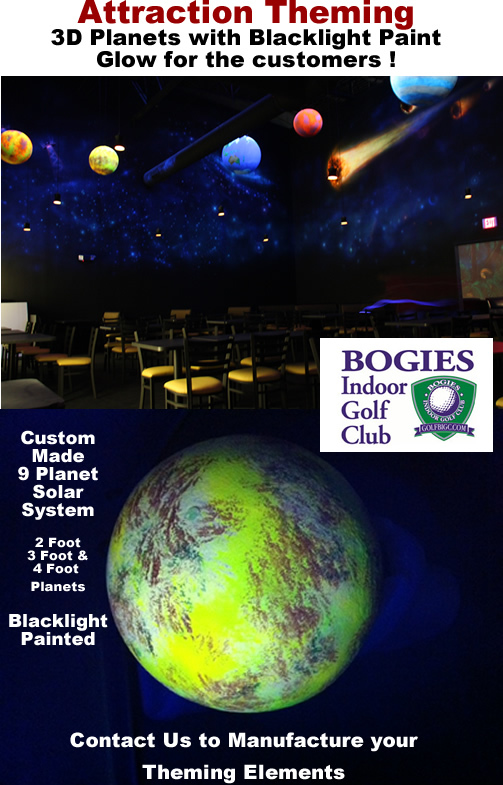 Perfect for photo ops and promotional events. 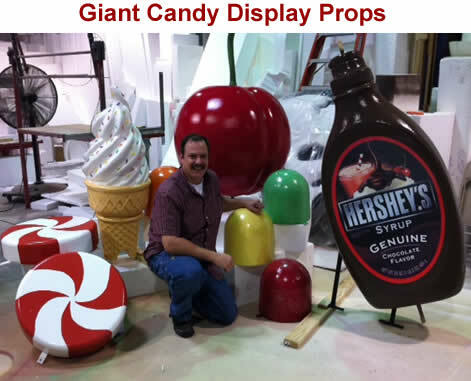 Custom Made Foam Candy sculpture props for Displays, Events, and Trade Shows. 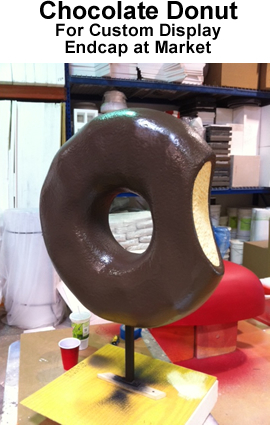 This custom Sculpture Prop is made of foam then plastic coated. 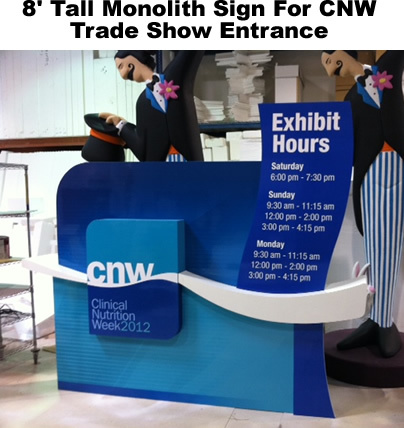 This Foam monolith sign was created for the CNW Show Event. Big foam tiger head sculpture prop made for parade float. This unit was carved in EPS Foam and painted. 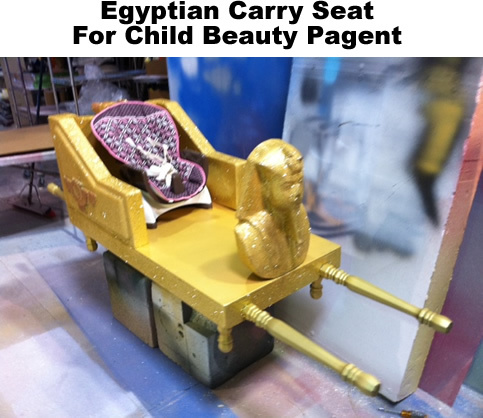 This Egyptian seat prop was created for a children's beauty pageant. 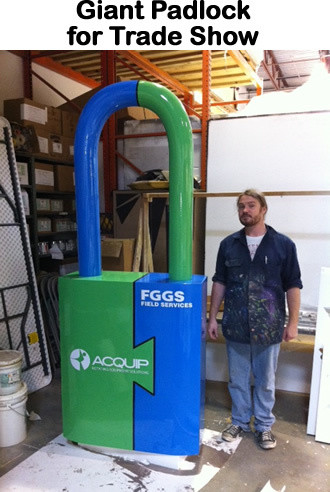 Big Football Foam Sculpture Chair Prop made for The Western Canada Lottery Corporation. Made for Natures Bounty. 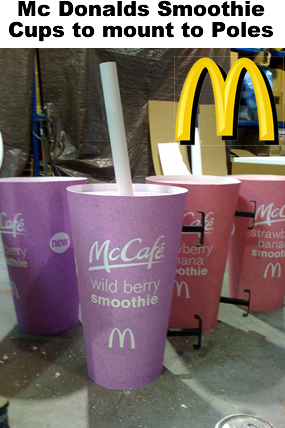 These units were carved in EPS Foam, sprayed in a Polyurea plastic coat, painted, and a vinyl wrap added for branding. Retail Foam Music Note Prop Displays made for BERINGER Wines. Ark of the Covenant Foam Sculpture Display Prop. 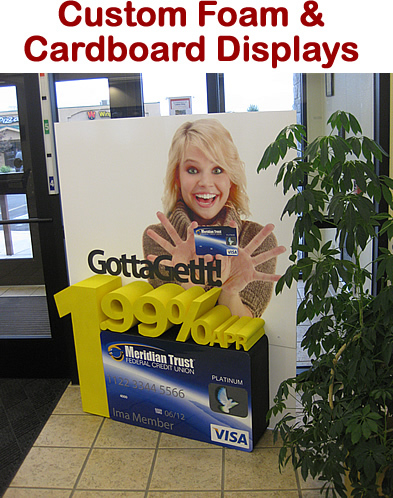 Perfect for events, Church and Temple Displays, Even Retail Displays! 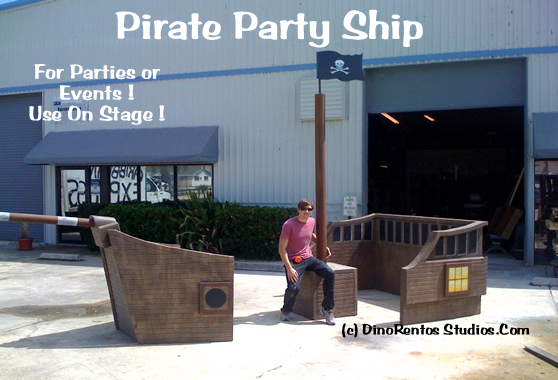 Custom Party Pirate Ship Foam Prop. 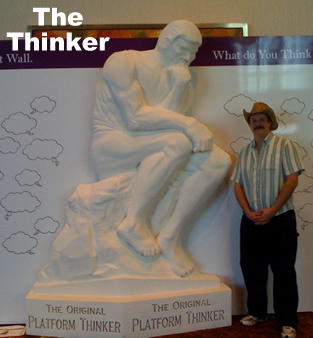 This is great for parties, corporate events, and tradeshows. 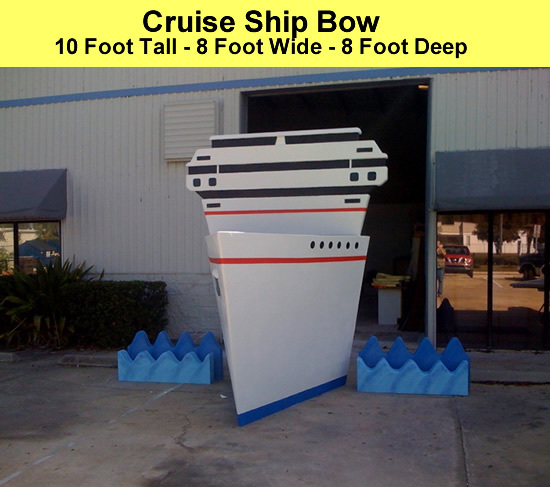 This Custom Foam Facade display was installed on the Celebrity Silhouette Cruise Ship. It was shipped to Germany for installation. Giant Board Game Tokens. These were manufactured at 8 FT. Contact us for custom sizes today! Custom Made Foam Sculptured High Heel Prop. 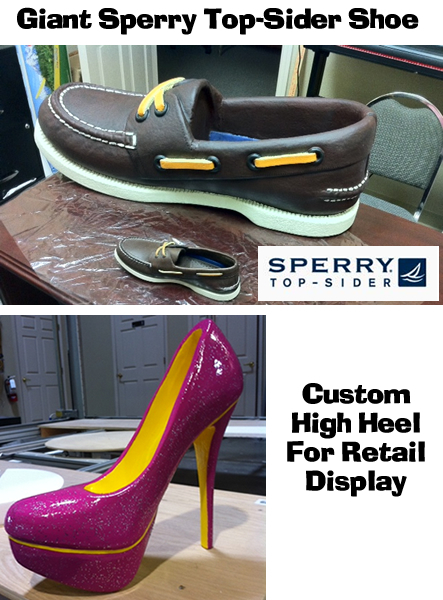 Contact us for replicas of your shoes or sneakers! These can be made in any size from your logo or art work. Available in different finishes and colors. This podium was made for the Michigan Woman's Conference and stood 4 FT Tall with a plexiglass tabletop. 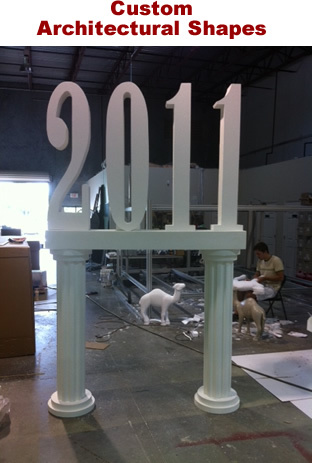 Custom Foam Achitectural Columns and Numbers for Tradeshows, Ceremonies, and much more! Jose Curevo Games, from Nerf Agave Plants to Game Components. 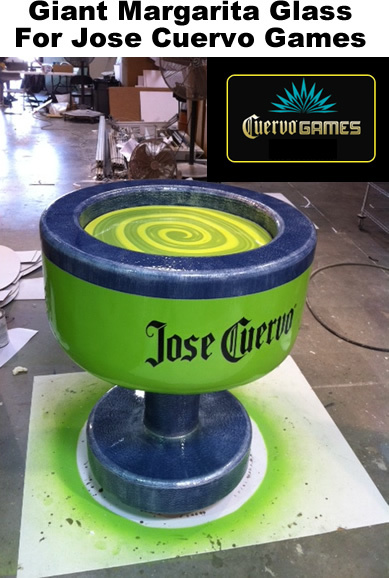 This year we manufactured the Giant Heavy Foam Margarita Glass Prop. 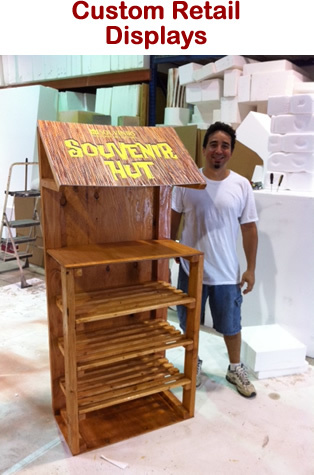 DR Prop Studios can do to help theme your Attraction. Big Custom Foam Wine Bottle Prop For Display. 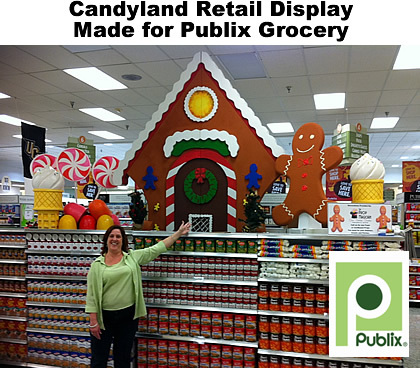 This is great for retail displays and promotions. Cartoon Network - Hall of Game Awards Feb 25,2011. See our Red carpet displays for Goldfish, NERF, Kids Footlocker and The New Scooby Do Movie . 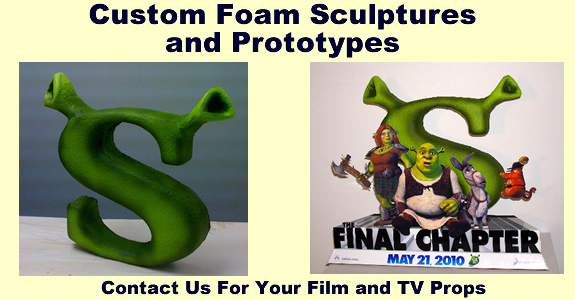 Contact us to make your Movie, TV or Retail Foam Sculpture Prop Display. 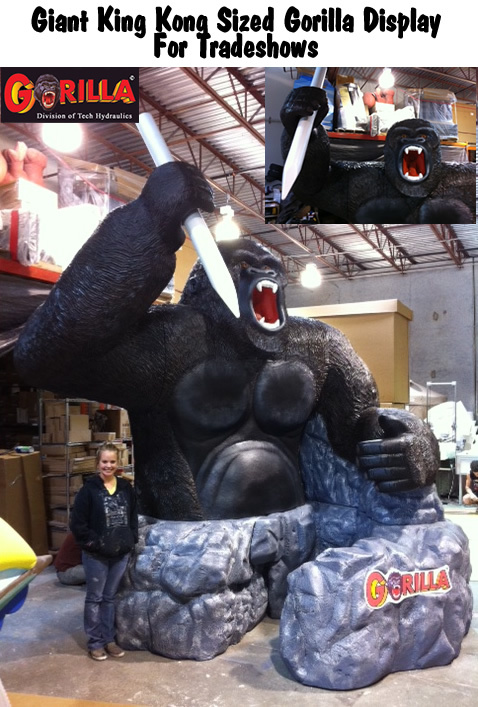 Currently in Construction is this Giant King Kong Gorilla Foam Sculpture Prop. 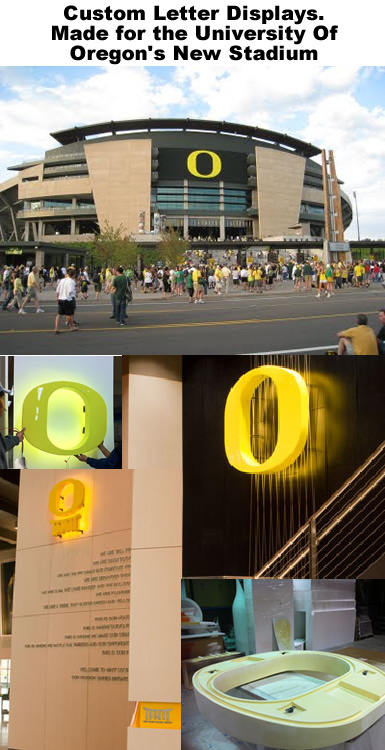 Oregon "O" for the new University Stadium. 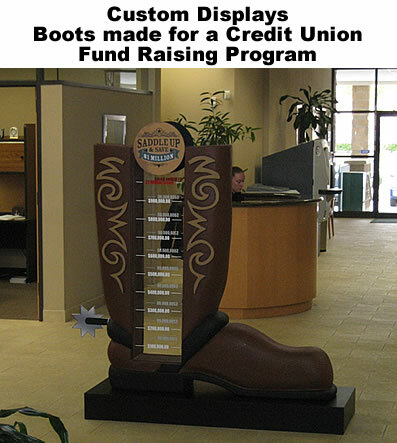 3 Ft Tall Custom Foam Boot with clear box was made for a Credit Union Fund Raiser. 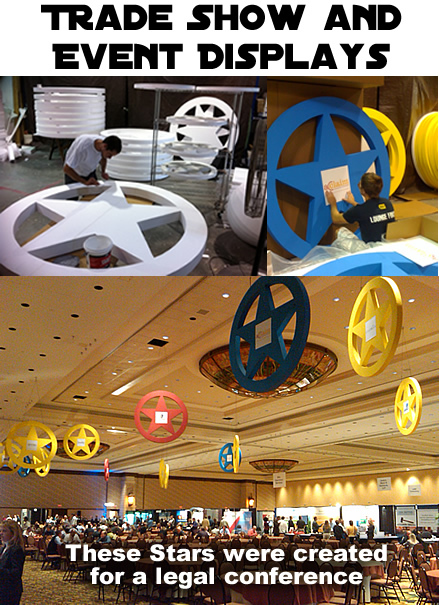 These Giant 6 FT Diameter Foam Texas Star Props were custom made for a legal conference in Texas. 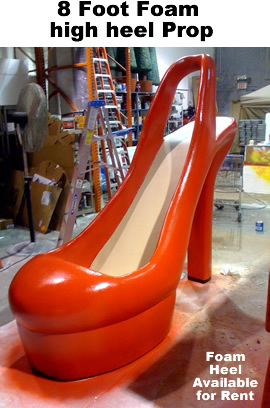 Giant 8 FT Tall High Heel Foam Prop Sculpture. Contact us today for your custom style and size! need for you event or display. 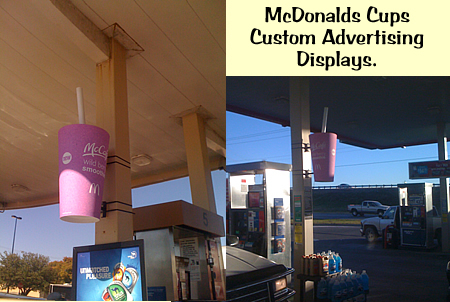 These Giant 4 Foot Tall McDonald Smoothie Cup Props were built to attach to Steel Beams at a Fuel Station in Texas. 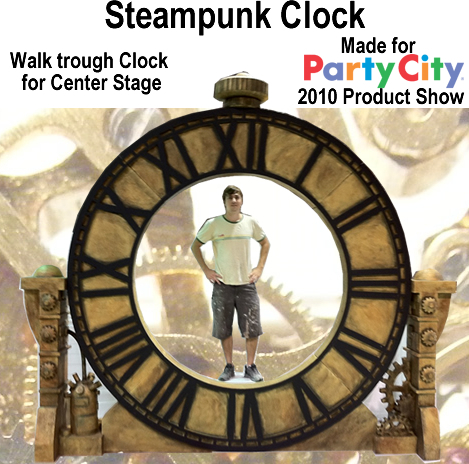 For Models to walk thru the clock and down on to the stage. 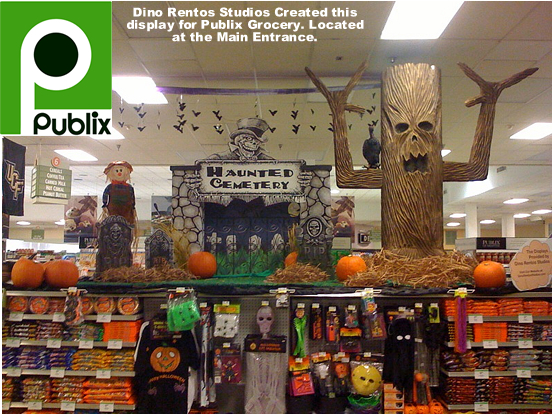 This Retail Foam and Cardboard Display kit was created for Publix Grocery Stores. 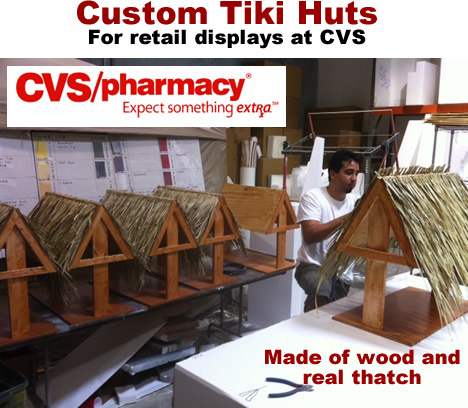 Contact us to make any Retail display kits in foam or Cardboard. This giant foam spine was created to wrap around a 30" billboard sign pole. THe spine segments have steel frames that bolt to the pole. 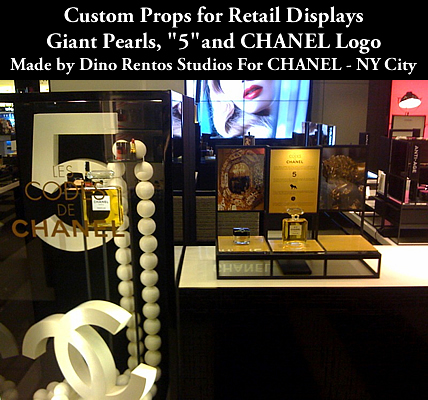 Contact DR Prop Studios for any Billboard 3D Sign componets / props that you need. 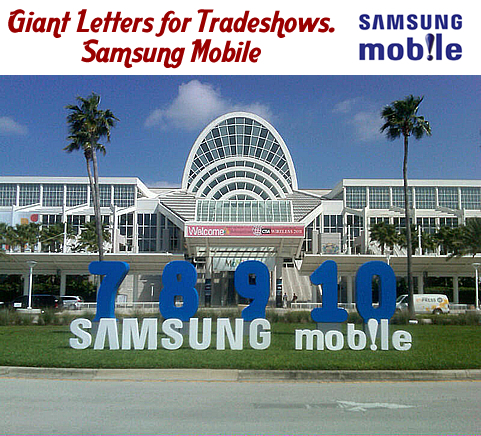 These giant 3D Foam signs can also be attached to buildings to theme the outside. Big - Giant 15 foot long Dog Bone Foam Bench Sculpture Prop and 4 Foot Tall foam Fire Hydrants. They have a heavy duty plastic coating and painted to specific colors. The Foam props were built for outdoor use with steel a frame work inside. 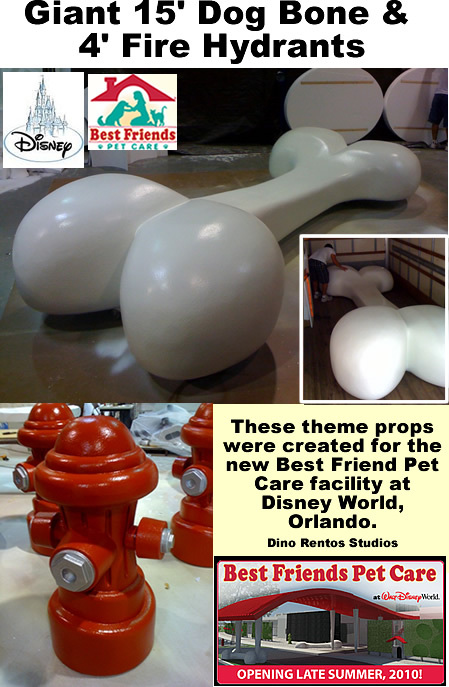 These theme props were created for the new Best Friend Pet Care facility at Disney World, Orlando. 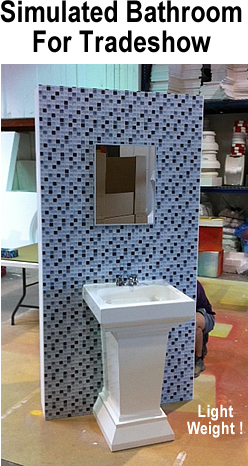 from Dino Rentos Studios to Manufacture their theme environments. 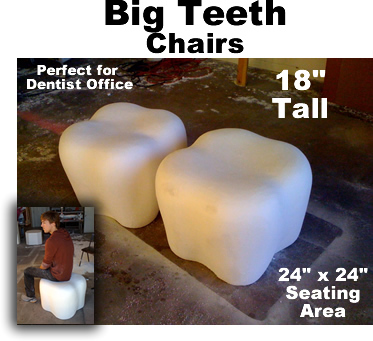 Big - Giant - Large Teeth / Molars Foam Props. Dentist office for the the visitors to sit on. 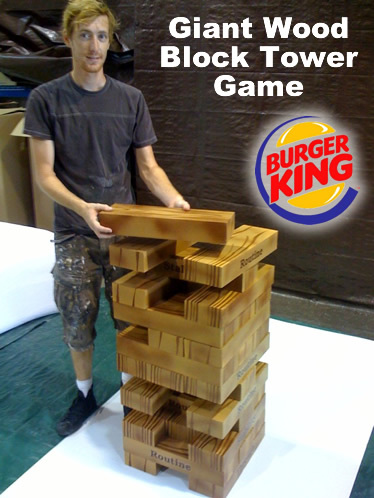 was created for Burger King. They had custom wording on the sides of the blocks. Perfect for the one you love or any retail display. 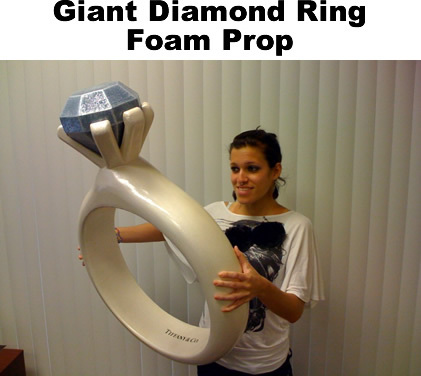 Proposal to his Girlfriend. Wow ! 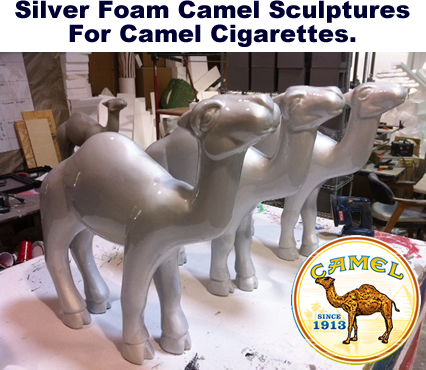 Big - Giant - Gold and Silver coin foam sculpture Props made to your needs ! 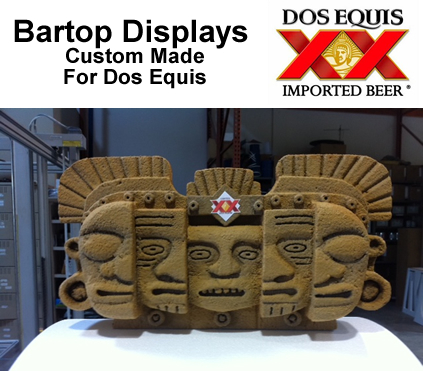 Perfect for Displays, Retail and Events. 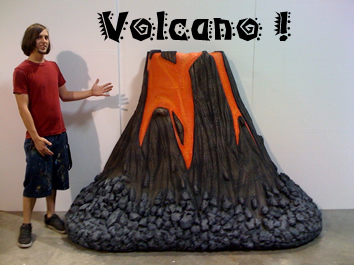 This custom made volcano foam prop sculpture was created for a Spa and Resort. It is used in their evening stage show. 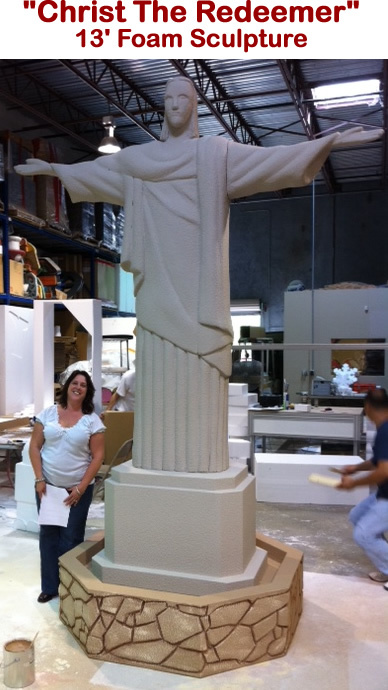 This foam relief prop sculpture was created for Manhattan Associates. 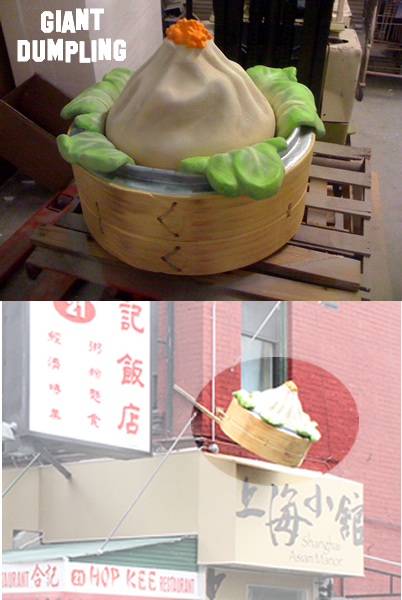 Chinese Steamed Dumpling - Custom Made Foam Prop for sign Installation. For a Facade remake of a local popular Chinese Resturant. Product release of the Video Game Raving Rabbits - "Travel In Time"
This 40' x 40' trade show booth was made of foam and plastic coated. This Giant 30 foot Pirate Ship Foam Prop, Foam Displays and Supporting extras were created in 8 Days. 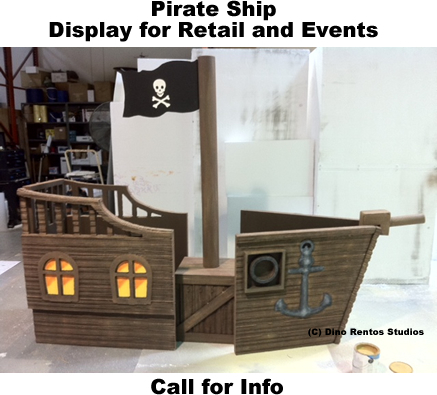 This Full size foam 3D Pirate Party ship fits a 6 foot table in the stern. 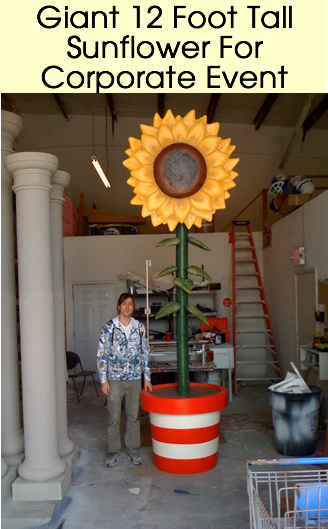 Giant 12 FT Tall Foam Sunflower Prop Sculpture was created for a Corporate Event. It was designed to have a break away stem that could be cut with a Hedge Clipper. 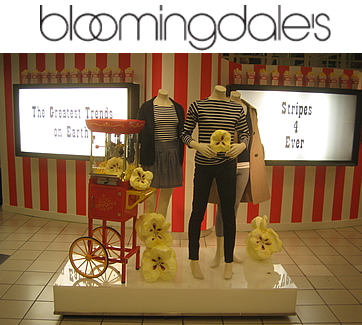 DR Prop Studios created these Giant Foam Popcorn Props for Bloomingdale's in NYC. 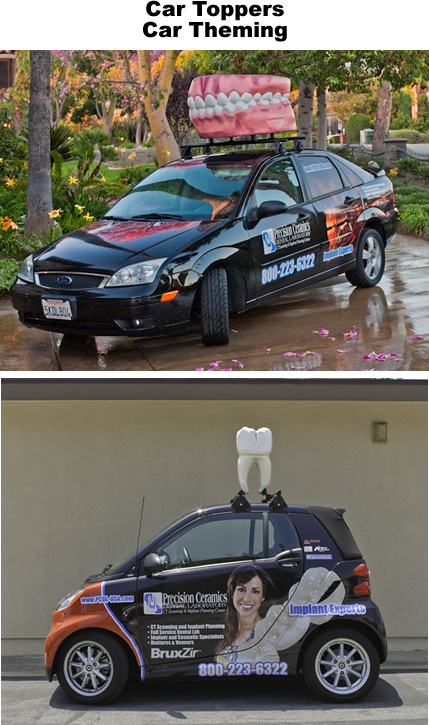 DR Prop Studios created this prototype for a marketing provider. The prototype was for presentation to Paramount and Dreamworks for distribution to movie theaters for the New Shrek 4 Movie. This Large Display stood 6 Ft Wide and 5 FT Tall. 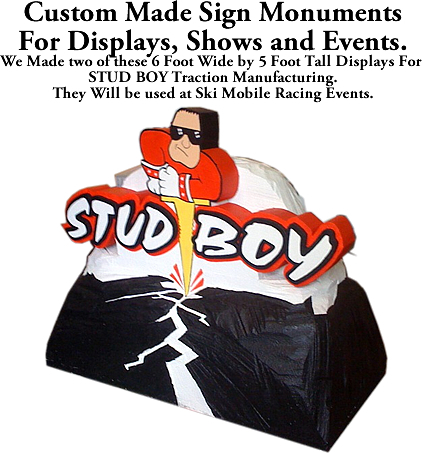 We made two Custom Foam Displays for STUDBOY TRACTION Manufacturing. 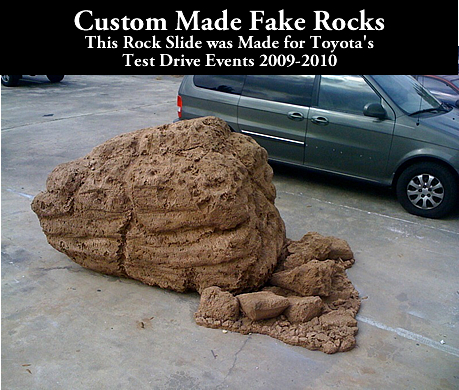 This Giant Foam Fake Rock slide prop was created for Toyota's Test Drive Events across the country. The Foam Rock Props were hard coated and ready to use outdoors on the test tracks. 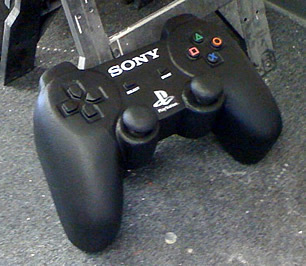 This Giant 3 Foot Wide Playstation Joystick Foam Prop was created for a custom sign. 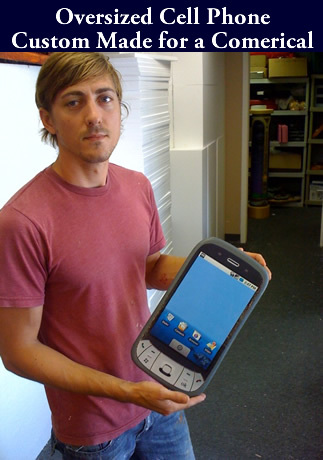 This custom made oversized cell phone foam prop was created for a TV commercial. were created for CHANEL-USA in Manhattan, NYC. 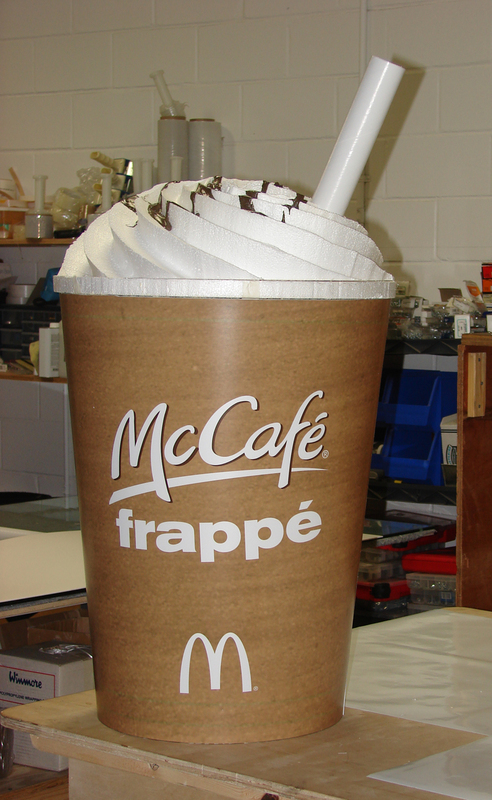 These Custom made Cardboard and Foam Coffee cups were made for McDonalds. The unit stood 8 FT Wide and 8 FT Deep and has 5 feet of waves on each side. 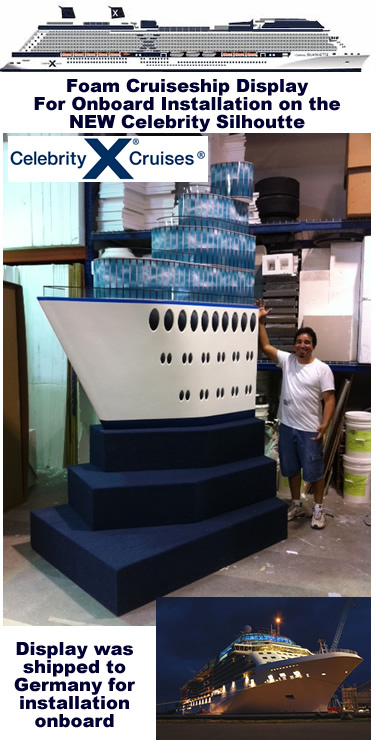 The Cruise Ship Foam Prop was made as a display for a Casino to give away free cruises. 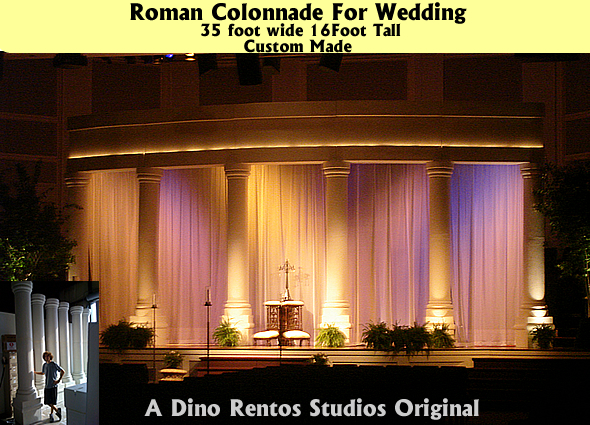 This Custom Giant Foam Roman Colonnade, Columns and capstones were created for a wedding. 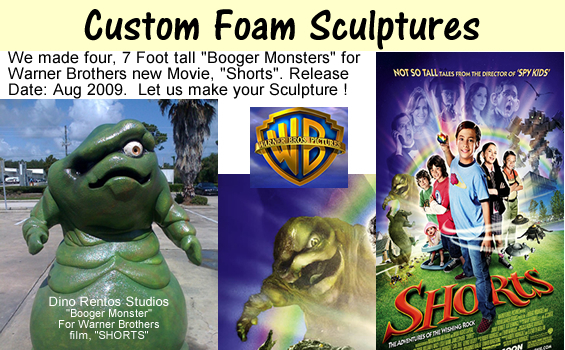 This Custom Giant Foam "Booger Monster" Prop Sculpture was manufactured for Warner Brothers new movie "Shorts". Release Date Aug 2009. 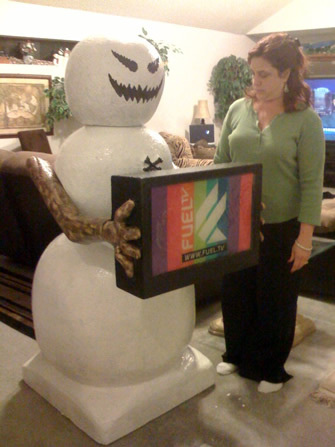 The custom prop was hand carved from EPS Foam and stood 7 FT Tall!! It was plastic coated and painted by the DR Prop Studios artists. 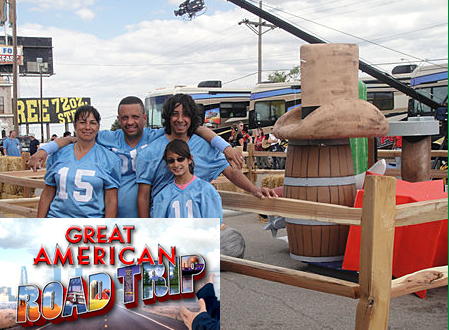 new TV show, "Great American Road Trip". The props were used in a challenge! 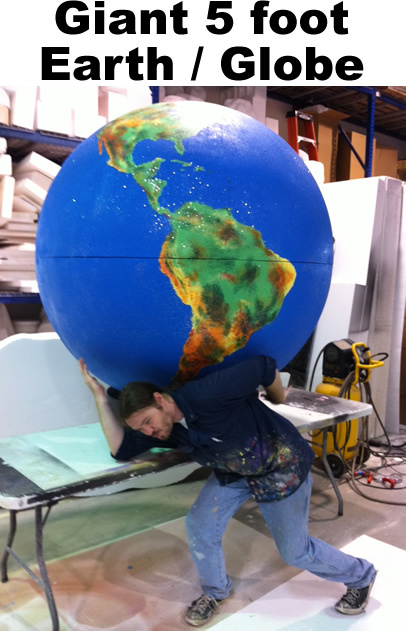 This Giant Custom Foam Book Prop was manufactured for the Myriad Gardens in Oklahoma City. The unit was created 3 FT Tall and was custom painted with a faux leather binder and worn pages.